Dion and Brian are back on the mic and trying to be all edgimacational-like. Brian drops some (frequently inaccurate) learning on Dion about the famous 1953 Jazz at Massey Hall concert and Dock Ellis’ (alleged) no-hitter on LSD, and Dion schools Brian on the historic rediscovery of the classic British silent film Love, Life and Laughter and the collection of Depression-era crime scene photos called Evidence by Luc Sante. 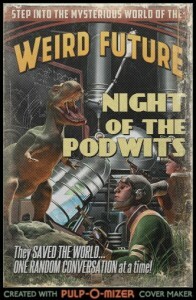 That, plus speculation on whether the Yellowstone supervolcano is about to blow (spoiler: it’s probably not), whether or not Legos are the tools of Satan (spoiler: they’re not), and the culinary legacy of Vincent Price on this deeply informative new episode of the Podwits Podcast!